A flat surface (as of a panel, wall, or fence) on which bills are posted. Specifically, a large panel designed to carry outdoor advertising. This is the definition of “Billboard” from Merriam-Webster’s Dictionary. Other dictionary definitions vary slightly, but the central idea is the same, that a billboard is a surface or panel upon which outdoor advertising is placed. Where does this definition come from? 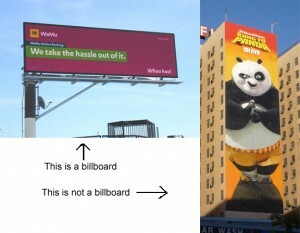 The word billboard doesn’t even appear in the L.A. municipal sign code, which only distinguishes between on-site and off-site signs (ones advertising goods and services available on the premises versus those advertising goods and services sold elsewhere) and defines specific types of signs, such as pole signs, monument signs, ledge signs, and so forth. Do we really care about this parsing of definitions? We ought to, because limiting the definition of billboard to exclude such things as supergraphic signs, digital signs, and wall signs is allowing developers to claim a reduction in “billboards” at the same time they seek entitlements for enormous amounts of new advertising signage. For instance, a lobbyist speaking on behalf of the Figueroa and Olympic Sign District last month told the city planning commission that adoption would actually result in billboard “reduction.” He was able to make this claim because some of the conventional variety on poles would be removed to make way for development, even though the proposed signage in the district would total almost 50,000 square feet.